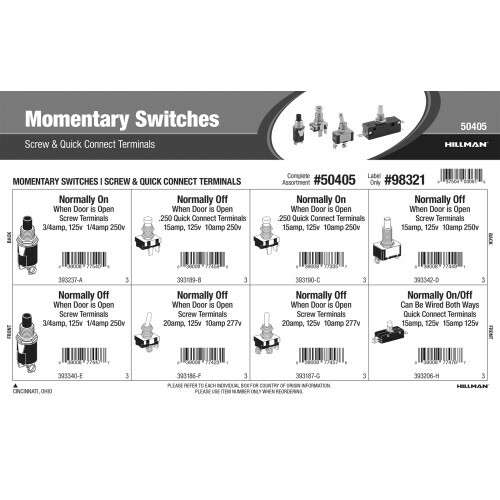 An assortment of screw and quick-connect terminal momentary push switches from The Hillman Group. A push switch describes any type of mechanism that activates a control by depressing a button cover or plunger. Variants included in this assortment come in 1/4amp, 3/4amp, 10amp, 15amp and 20amp capacities. Full assortment contains eight (8) items comprised of Hillman item numbers #393186, #393187, #393189, #393190, #393206, #393237, #393340, and #393342.